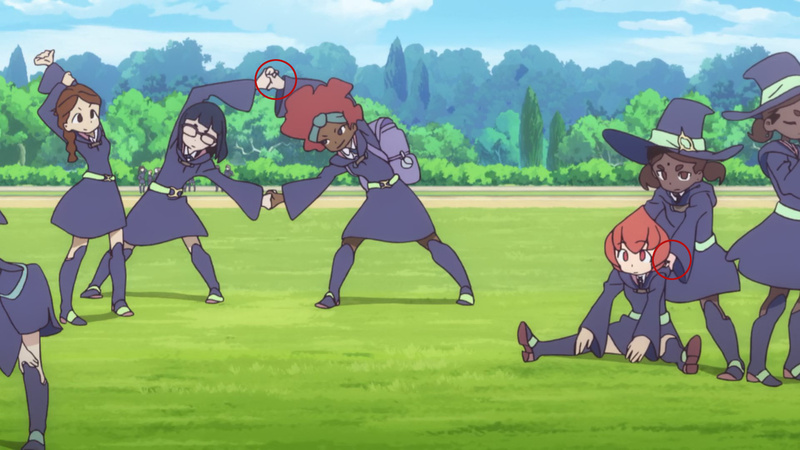 The least spectacular episode of Little Witch Academia is still a fun time, and it’s a nice chance to learn about the show’s approach to the creative process as well. 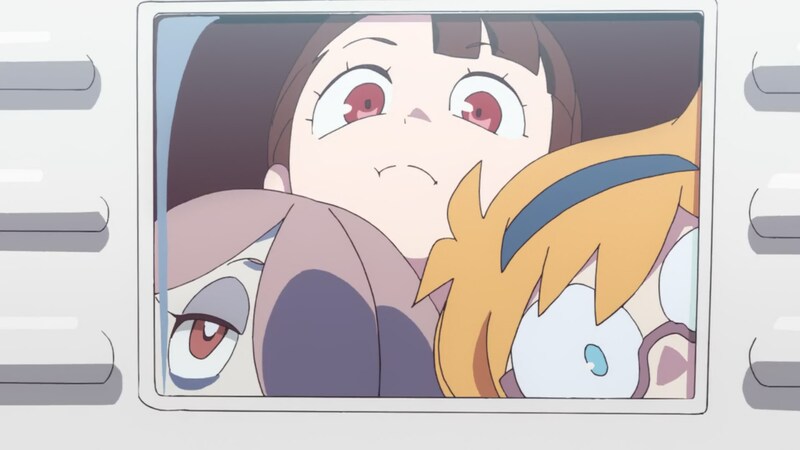 Little Witch Academia earned a bit of a break after last week’s veritable high-speed event, so we were due some low-key affairs. This is the first episode that thoroughly felt like a series of developments we would have never seen if the series hadn’t expanded into a full-length TV show. 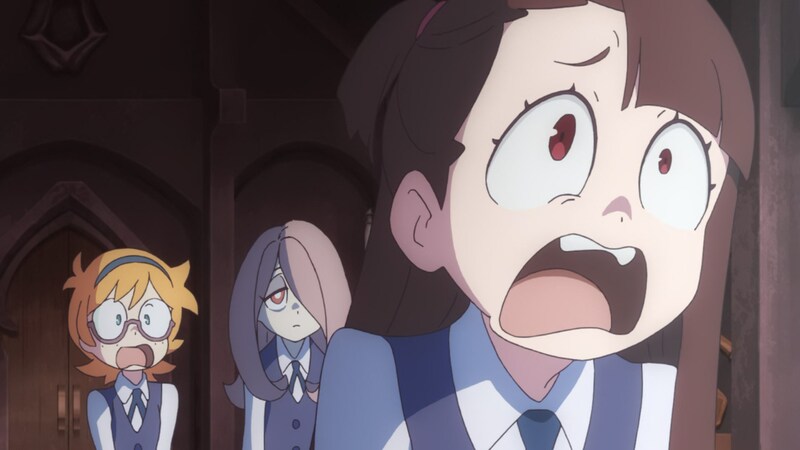 So while in isolation I found it a definite step down, in the long run it might be these moments that make LWA TV work on levels it couldn’t before; not that I find its potential new goals inherently more interesting, I’m fairly outspoken about my feelings on the original work being a perfect realization of its concept. 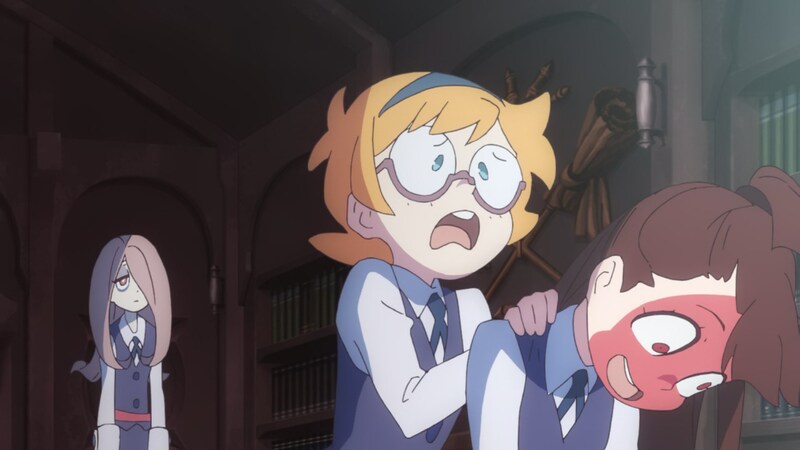 But seeing Lotte and Akko’s contrasting attitudes towards their idols, and details like her cosplaying friend turning out to be a teacher at the school, will only make me grow even fonder of these characters. Since we’re already 4 episodes into the series there are some production trends we can start discerning, which is always interesting. Perhaps the most important one is the heavy bias towards storyboarders as the creative drive over the episode directors. 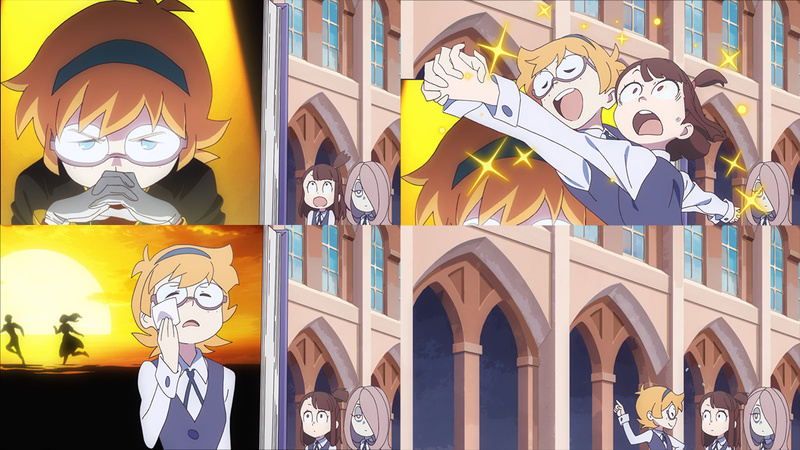 The two roles are so connected that they’re often conducted by the same person, but LWA TV has been keeping them separate. They’re consistently trusting the most inventive artists with the storyboards, while management-style people act as directors; when it comes to it, part of an episode director’s role is to supervise all departments involved in the production process and make sure it all gets done, hence why some production assistants naturally move up to that role – like Yuichi Shimodaira, who was in charge of this week’s LWA. Entrusting the most idiosyncratic creators with coming up with all the shots for the boards and generally controlling the feel and flow of the episode does make sense as well. It’s important to understand that this approach limiting the episode directors’ creative input isn’t the only option or even a standard one, though! Unlike its older brother Khara, Trigger itself isn’t exactly overflowing with directional juice to begin with. It’s understandable then that they seek freelance talent for those storyboard duties, and Hiroaki Sakurai fits the bill perfectly. 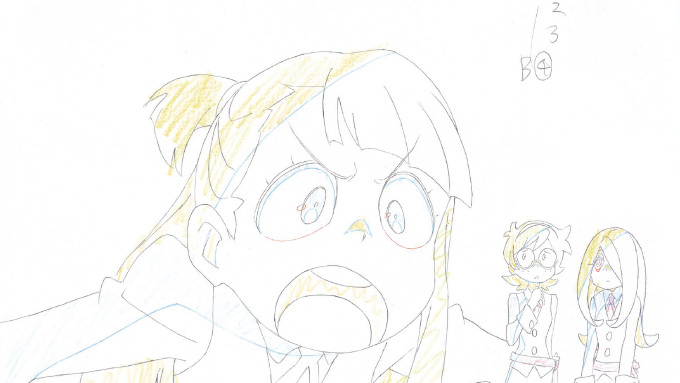 He hadn’t collaborated with the studio before, but a series like Little Witch Academia suits him very naturally; he matured handling episodes on 90s productions like Akazukin Chacha that were all about the whimsical fun and magic, and then went on to become a prolific director who ended up in charge of shows like Jewelpet, more or less the modern successor of that style. So while it’s not a spectacular episode, I feel like he really gets the tone a fantasy kids show should have…even when it’s one airing at midnight thanks to an irredeemably broken industry. The scene that personally stood out the most when it came to his boards was Lotte fervorously telling her friends about the Not-Twilight series of books she happens to adore. She snaps in and out of the frame where she’s giving her theatrical explanation, a rather cartoony way to show off her passionate fan self in contrast to her usually timid demeanor. I believe the effects that appear in the background during this whole scene might have been drawn by the show’s main animator Takafumi Hori, but truth to be told they barely moved and were hardly the point of the sequence. Expect him to return more explosively soon. This is as good a time as any to mention that there just wasn’t much animation worth talking about. The show can sustain itself on its delightful fundamentals, but even those rely on strong animation directors, and I’m torn when it comes to Naoki Takeda’s work here. We still got multiple fun expressions and even one short sequence where you can feel the series’ visual spirit is truly alive, but otherwise the drawings were fairly pedestrian. It’s an oversimplification, but if I split the animation director role between the artistic sense and the capability to ensure high quality drawings and motion, he’d easily pass the former but struggle with the latter. Takeda doesn’t have much experience when it comes to this role yet – I believe this was even the first time he handled it mostly by himself – so he might have simply not acclimated to the responsibilities. Last week’s inexperienced yet fantastic animation director Kai Ikarashi holds him in high esteem, which lends credibility to the idea that Takeda really is a strong animator who isn’t quite shining in this new role yet. 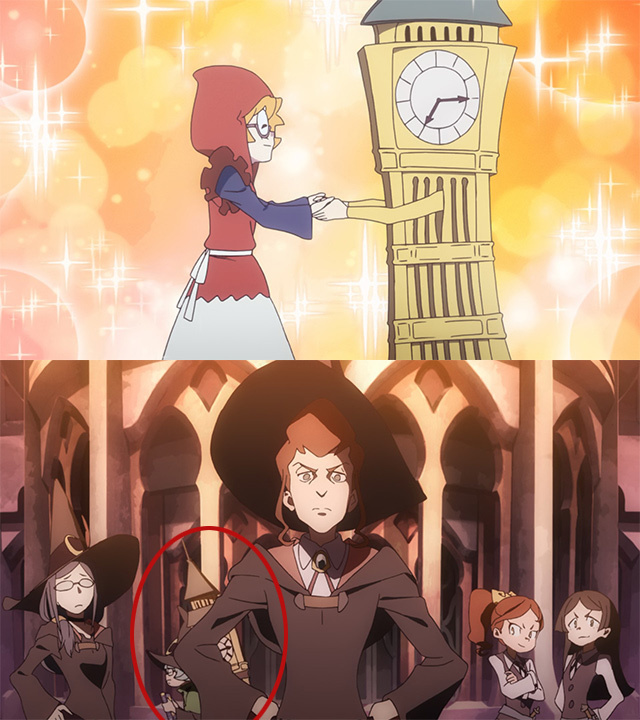 This time he had some support from Kengo Saito, who does seem particularly suited to supervision because he’s done so to some degree for three consecutive episodes; LWA’s pool of animators is fairly small so recurring appearances are bound to happen, but Saito’s consistent animation direction presence is rather extraordinary. Mayumi Nakamura also helped out a bit, marking the first time a woman approaches key roles within an episode of this show. I’ve seen Trigger referred to as a boy’s club before so discussing that will be interesting, but that’s going to be a heavy subject on its own so I’ll come back to it at a later date. Otherwise the list of animators is what we’ve come to expect – a small team at Trigger assisted by tons of freelancers, with less big names this time since the show needed some rest. There are some exceptional projects capable of maintaining an outstanding baseline of animation and seemingly not worry about production decay, some of which we’ve already covered in this site. 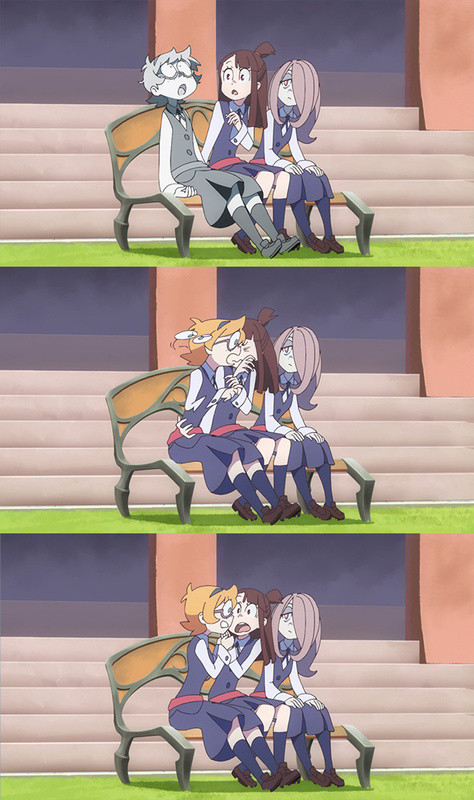 And LWA TV isn’t one of them after all, but it gets away with it with its charm. The reason I skipped some general topics just now was that I wanted to get into specifics about some misconceptions. 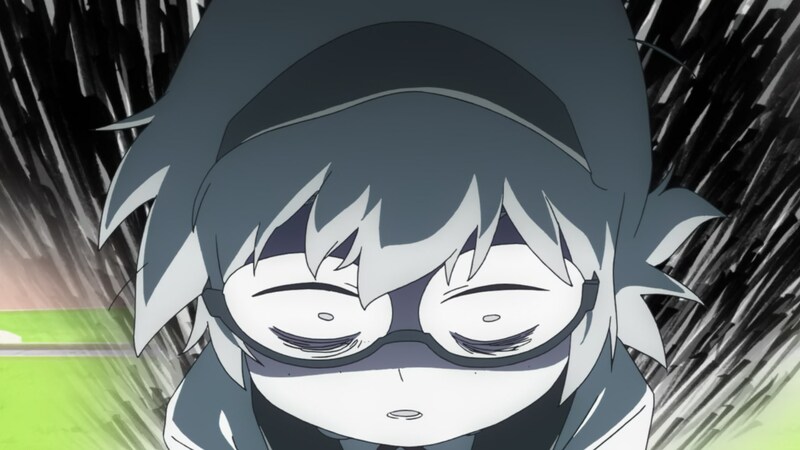 I figured this would be a good use of this weekly feature, especially with a show like this that is bound to attract attention from people who don’t generally pay attention to anime and how it works – a good thing, mind you! A certain tweet (which I’d rather not link because it was surrounded by nasty discussion) blamed Netflix for recoloring characters to make them black, based off this scene from last week’s episode. The horrible attitude these ideas are born from speaks for itself, so I’d rather address the production side. The truth is that while Yoshinari came up with the design concepts for all characters, not even Trigger is in charge of the show’s colors. The series’ color designer Yukiko Kakita who established the main palette belongs to T2 Studio. The color coordinators that come up with situational alterations and supervise the episodes are also from other studios; that one in particular was handled at Jumondou, while this week’s was painted by FINE COLORs. The degree of separation between the colorists and Netflix is even greater than people seem to imagine. The easiest way to prove those complaints as nonsense would of course be pointing out that the same coloring errors were present in the TV broadcast of the show, but this way people might get to learn a bit more about who does what. And for the record, Netflix appears to be fairly hands-off when it comes to this project. They’re not even part of the production committee, so it seems like despite having been part of the project planning process their input wasn’t intrusive. I would praise a corporation for giving cash and letting creators do what they please, but this is the same company who has no idea how to handle distribution when it comes to anime so I’ll refrain. And next week… maybe the first fully outsourced episode? 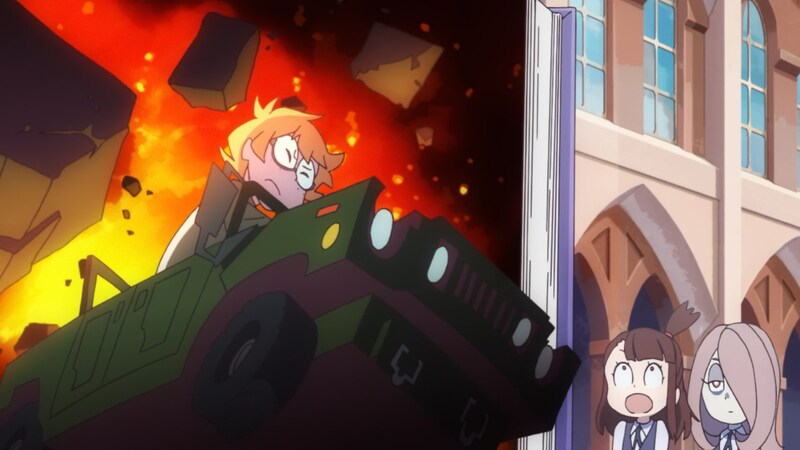 Good thing we can always trust Akko to luck her way out of nasty situations. I believe that makes you officially as cool as Chumlee and Inferno Cop.